Do Angels Watch the Clock? What is time? Does it exist? Most of us would say that it does, but could it be an illusion, construct, or artifact of our physical existence? Perhaps it is all of these. It is said that the soul/spirit is eternal. Eternity by definition is never-ending. If we place our spirit-self in the context of eternity, does time have any meaning or importance? A period of incarnation of the spirit is vanishingly small on the scale of eternity. In fact, “scale of eternity” would seem to be an oxymoron. Eternity confounds measurement just like infinity. To try to scale eternity with a measure such as this thing we call time would seem to make no sense. At the same time, during our very brief, finite period of incarnation, time and distance are useful measures within the physical life. 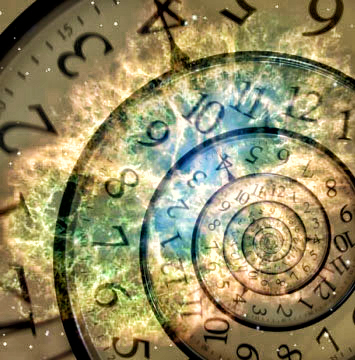 Does the concept of time make any sense or have any utility when we exist purely in spirit form after death? Likely there are many different views relating to this question. In physical form we know our lifespan is finite. Therefore, it seems natural to apply measures to our daily activities on Earth. However, in spirit form we presumably know that we are eternal. Therefore, the length of any particular lifetime or the sequence or length of events on Earth likely does not matter to the spirit. The only thing that may matter is how the experiences of our physical life inform our spiritual growth and understanding. You might like to see a related article titled On the Nature of God. The article describes God as enigmatic and paradoxical with attributes beyond our comprehension that conflict with our worldly notions of time, space, and form. These are difficult topics and no doubt there are many different ways of thinking about them. I would very much like to hear your perspective. Does spirituality require a religious framework? How does one express their spirituality outside of religious practice and in their everyday life? What are the characteristics of a truly spiritual person? These are a few of the questions explored in the articles, verse, and dialogues found here. What Natural or Spiritual Laws Govern Our Lives?